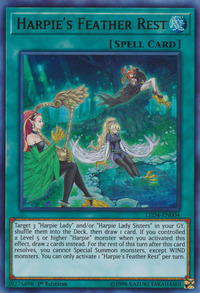 Target 3 “Harpie Lady” and/or “Harpie Lady Sisters” in your GY; shuffle them into the Deck, then draw 1 card. If you controlled a Level 5 or higher “Harpie” monster when you activated this effect, draw 2 cards instead. For the rest of this turn after this card resolves, you cannot Special Summon monsters, except WIND monsters. You can only activate 1 "Harpie's Feather Rest" per turn. Harpie Harpist, Harpie Dancer, and Harpie Channeler appear in this card's artwork.